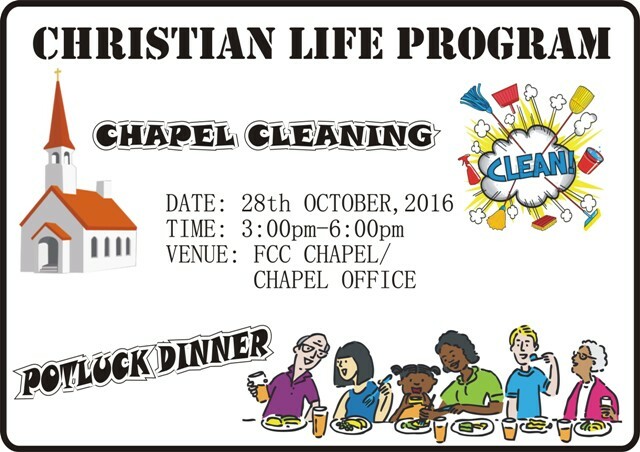 All Christian students (Intermediate and Baccalaureate) are invited to join us on Friday 28 October 2016 from 03:00 pm to 06:00 pm for Chapel Cleaning and Potluck dinner. In the true spirit of service, we will clean the FCCU Chapel together and later have the food together. This is a Potluck dinner, you are required to get yourself registered in the Chapel Office over the next week.